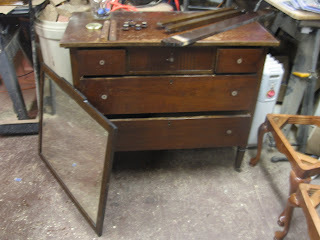 Welcome to my blog which follows my furniture restoration business. Please feel free to comment at the bottom of the post, and if you would like a response please leave your email address. you can also contact me directly at info@johnmarkpower.com. And by all means, if you like something please feel free to share it. 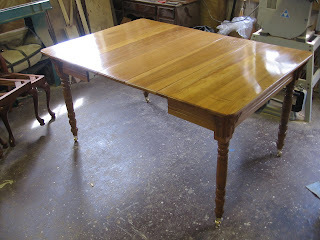 Realizing that each entry pushes the old ones further down the list I though it would be nice to repost photos of the table and chest I recently completed with before and after shots. Here they are. For a look at the whole process you can scroll down the sites to my previous entries. 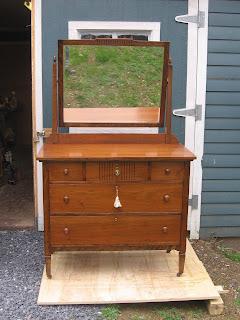 I am a cabinet maker located in Harpers Ferry, West Virginia. 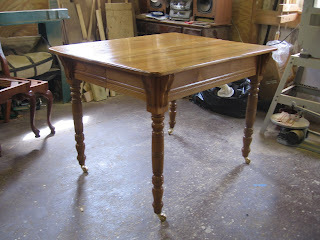 I specialize in the restoration of original finishes as well as the construction of new furniture. 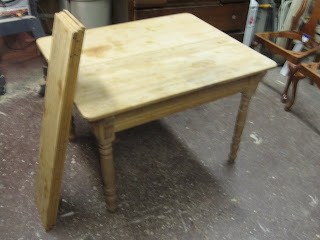 I offer complete restoration services including refinishing, upholstery, caning, and all manner of furniture repair. for a complete list of my services and a gallery of my work please visit www.johnmarkpower.com . All Posts Copyright 2011 John Mark Power. Watermark theme. Theme images by andynwt. Powered by Blogger.